Clean lines and a beautifully detailed monogram "N" add elegance to this antique quadruple silverplate serving tea completer set consisting of a waste bowl, creamer and sugar bowl, with a butler's finish on the main body of each antique silver piece, and highly polished silver at the top and base. Angular applied handles with spurs add to the graceful lines of this silver tea set. All of the handles show a minimal amount of silver plate wear. The antique silver waste bowl shows very minimal use to the outside of the bowl, with only expected minor spots and surface scratches. The inside does indicate use with multiple tiny scratches on the inside only. The handles who some silverplate wear from use over the years. The waste bowl measures 7" from handle to handle, 5.5" high to the top rim, 15" in circumference and weighs 15.9 ounces. Beautifully monogrammed with an "N" in a deeply engraved and detailed "N". The backs are plain, with only the satin silver finish. The matching antique silver creamer shows no indication that it was ever used. Only minor marks on the outside of the creamer expected with age. The inside is as bright as it was the day it was manufactured. May have had a thin gold coat inside at one time as seen in the photos. 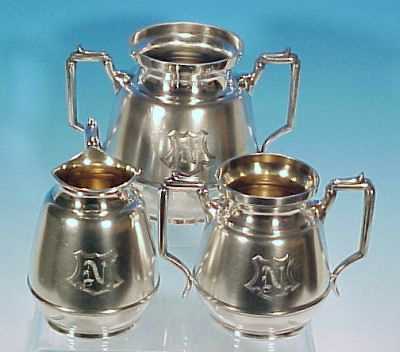 The antique silver creamer measures 4.5" from the tip of the spout to the tip of the handle, almost 5" high, 11.5" in circumference and weighs 10.7 ounces. Beautifully monogrammed with an "N" in a deeply engraved and detailed "N". The matching open antique silver sugar bowl also has no dings, dents or silverplate wear or loss noted. The inside of the sugar bowl shows very little, if any, use marks. May have had a thin gold platecoat inside at one time. The sugar bowl measures 6" from handle to handle, stands 4.5" high, 12" in circumference and weighs 10.8 ounces and also has the "N" monogram on the front. You can learn more abou the Simpson Hall & Miller Silver Company from our Silver Manufacturers pages. A beautifully elegant monogrammed completer tea set for your buffet or to add to your fine silver collection. Touchmarked on the base with Simpson Hall Miller & Co. mark and the pattern number "2030". A matched set.